This text is included to show how Whig political ideas from the seventeenth century are laid at the base of the political order of the new United States of America in 1776. The most direct paths of influence go through Locke's The Second Treatise of Civil Government (1689, external) and Sidney's Discourses Concerning Government (1698; password required). Compare the complaints against George III here with those against James II in the 1689 Bill of Rights. 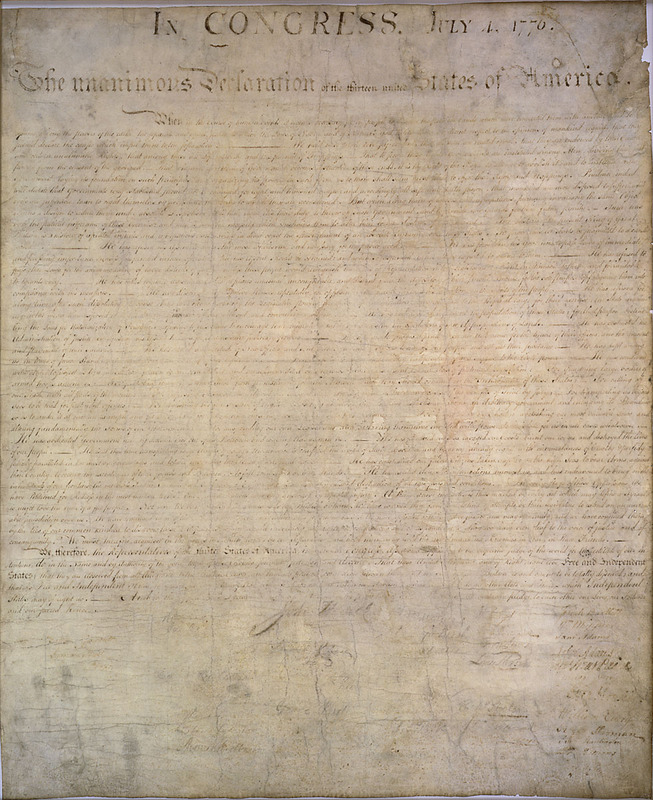 The original handwritten Declaration of Independence of July 4, 1776, "by the representatives of the United States of America, in general Congress assembled," is now badly faded; cf. William J. Stone's 1823 engraving. For drafts and changes, see D.J. Mason's The Declaration of Independence Home Page at Duke University. For some notes on the philosophical background, see Library of Congress: About the Declaration of Independence. See also the urban myth What happened to the signers of the Declaration of Independence? along with an examination of the evidence (external). The Constitution has no inherent authority or obligation. It has no authority or obligation at all, unless as a contract between man and man. And it does not so much as even purport to be a contract between persons now existing. It purports, at most, to be only a contract between persons living eighty years ago. And it can be supposed to have been a contract then only between persons who had already come to years of discretion, so as to be competent to make reasonable and obligatory contracts. Furthermore, we know, historically, that only a small portion even of the people then existing were consulted on the subject, or asked, or permitted to express either their consent or dissent in any formal manner. Those persons, if any, who did give their consent formally, are all dead now. Most of them have been dead forty, fifty, sixty, or seventy years. and the constitution, so far as it was their contract, died with them. They had no natural power or right to make it obligatory upon their children. It is not only plainly impossible, in the nature of things, that they could bind their posterity, but they did not even attempt to bind them. That is to say, the instrument does not purport to be an agreement between any body but "the people" THEN existing; nor does it, either expressly or impliedly, assert any right, power, or disposition, on their part, to bind anybody but themselves.